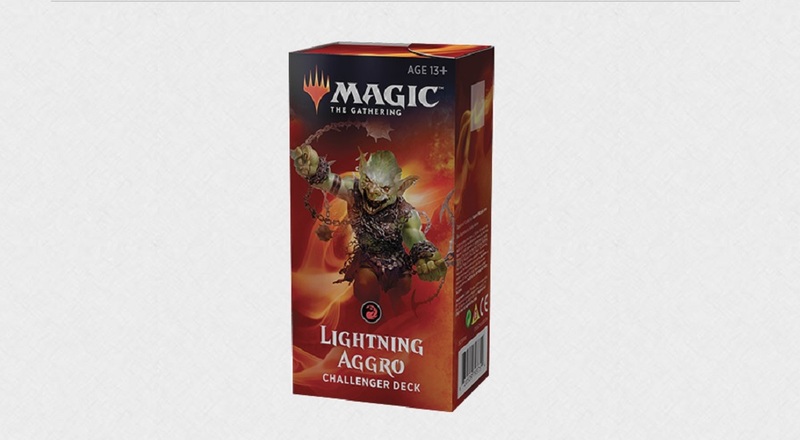 Last year Wizards of the Coast did an amazing job with their Challenger sets: or, $30 starter kits that allow players to pick up Magic: The Gathering instantly and play competitively. The gist is that not only are the decks themselves formidable, but they also come with several expensive cards that are roughly $10 on their own, giving the deck monetary value outside of the standard format. The catch is most of the cards are rotating out later this year, so you're getting a good six months or so with them. 2019's decks include United Assault (mono-white), Lightning Aggro (mono-red), Deadly Discovery (Black/Green), and Arcane Tempo (Blue/Red). Breaking them down, United Assault is actually a decent deck as-is. Life gain should win you some games at the Friday Night Magic level and two History of Benalias and two Legion's Landing cards basically pays for the $30 fee on their own. Lightning Aggro is arguably the best deck of the lot, adding in nearly everything you'd need outside of maybe another (expensive) Rekindling Phoenix that pays for the box by itself. Deadly Discovery (Golgari) is similarly decent, offering up three pricey dual lands: plus with four Wildgrowth Walkers and four Branchwalkers/two Jadelight Rangers, that should give you enough of an edge to win. I would have liked to have seen at least one Assassin's Trophy, but given the newness of the card and the cost that's probably too much to ask for a Challenger deck. Then there's Arcane Tempo, which is probably the worst set out of the box. Weirdly set on going for a drake/Arclight Phoenix/Niv archetype the deck is all over the place with several pricey instants and sorceries that are going to be really hard to get on the table without shocklands and a lucky Gobin Electromancer draw. While this is the most future-proof of the lot, with plenty of recent Ravnica cards that won't be rotating out later this year, you'd be better off just cracking this for a few Nivs and an Arclight Phoenix and making your own deck. Modified versions of these already exist in Magic: Arena, but it'll be interesting to see if Wizards provides any cross-promotion for those who buy the physical sets going forward (just like they do for Planeswalker kits).